Have you got a shadow? Then hold onto it... before it betrays you! Elves who live secretly in the midst of the human world are known as shadows. After a near miss on the king during a royal hunt, the rumour is spread that the elves were trying to kill the king. 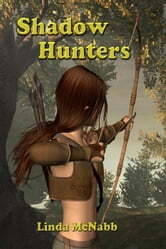 From then on, the elves live in constant fear of the king's shadow hunters, who seek to capture and lock them up. Rhonan and his sister, Dyahn, are half-human half-elf and when they sneak away to play with the wild ponies on the moors, they accidently lead the shadown hunters back to their family. In a twisting, turning tale of dragonet, magic stones and broken promises, they must try to save their parents from the wrath of the king. But something terrible is about to happen, and the magic the elves have relied on to conceal themselves begins to fade, leaving them exposed to the wily shadow hunters. Time is running out for Rhonan and Dyahn.